and click on the part you need. Buy Direct From The Manufacturer ! Classic Sheet Metal has been the manufacturer of quality Thunderbird sheet metal repair panels for over 35 years. Welcome to our 1961-1963 Thunderbird store. 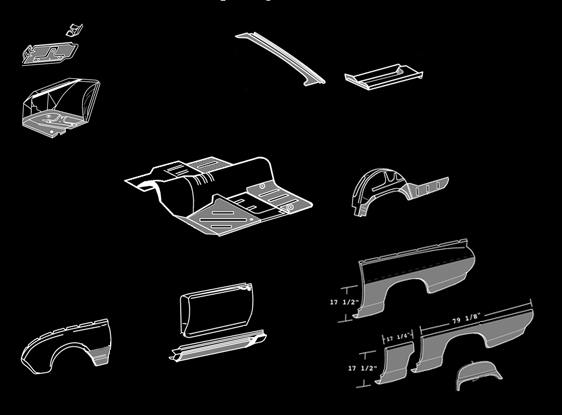 The image on the left is an exploded view of your 1961, 1962 or 1963 Thunderbird. If you run your mouse over the area you need and click it, it will open a page with a photo gallery of the parts we manufacturer for your car. Click here to go directly to our store, where you will be able to purchase the parts you need. We also include related items on the left, so if you order one side of a part the opposite side is easily found. We have taken special care to make this experience as enjoyable as possible.